Waxing your strings and cables is a must. Doing so will greatly prolong the life of the strings and cables. Even crossbows need a little tender loving care. While your crossbow may shoot very accurately today, that doesn’t mean it’s going to perform to the same standard six months from now, and that’s why maintenance is so critical. And don’t worry, you won’t need hours and hours to fine-tune your baby. Properly maintaining a crossbow doesn’t take that much time. Following are a few things you can do to make sure your crossbow shoots like a dream for years. So go ahead, give it a little TLC. Like regular bows, crossbows have strings and cables that begin to wear out over time. By regularly waxing the strings and cables, you can prolong their life. The strings and cables on crossbows should be waxed more often than regular bows. 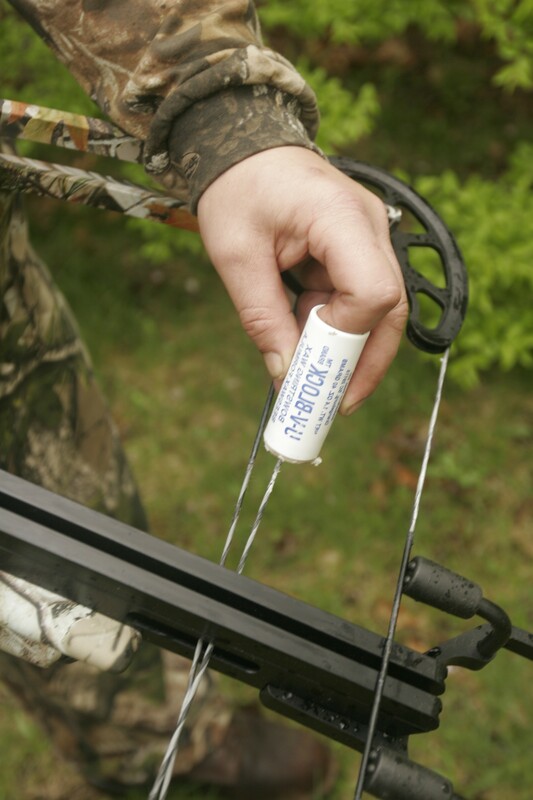 Like bowstrings, crossbow strings can fray and dry out, but regular waxing keeps them going strong for years. Waxing a string only takes a few seconds so doing it every week or at least once a month can make a big difference. Having a string break in the field can end a day of hunting or cost you a nice buck. Keeping your crossbow rail lubed is important, too. “At TenPoint, we suggest that the rail is lubed every 75 to 100 shots,” Wood said. “If you lube it more than that and use lots of lube, the center serving on the string can get worn out.” Wood also advised crossbow users to stay away from petroleum-jelly-type lubes. “We suggest using an oil-based lube that dries quickly,” he said. 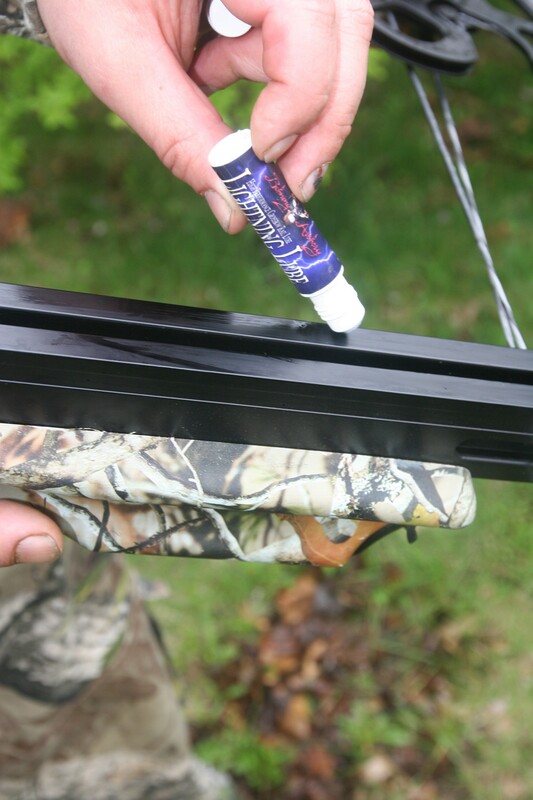 A Vaseline-based product will collect dirt and can cause problems with the crossbow, especially the trigger assembly.” If your crossbow gets wet because it falls in the water or you hunt in the rain, lube the rail immediately. Lube the rail every 75 to 100 shots with an oil-based lubricant. Some crossbows have timing issues similar to issues of a two-cam bow. Cams that get out of sync with each other can cause erratic arrow flight and other problems. Many crossbow companies have timing marks on the cams, and the cable should align perfectly on the same mark on both cams. If you think your cams are out of time, Kempf suggested you take your crossbow to a dealer who understands how crossbows work to have them adjust the cables. Don’t be afraid to bring it to a pro shop. Many archery shops have someone on hand who knows how to work on crossbows. Like guns, crossbows have a trigger and safety mechanism. A few drops of oil placed in your trigger mechanism and in your safety slide at least once a year will keep the trigger working well and prevent the safety from getting rusty or freezing up. Due to excessive vibration created by high-speed crossbows, hunters should regularly tighten all nuts and bolts found on their crossbow, Wood advised. Making sure all your nuts and bolts are tight ensures that something won’t come loose in the field. “Over time, the vibration from shooting a crossbow can loosen things up,” he said. “Scopes, quivers and other add-on items are especially prone to become loose and fall off. 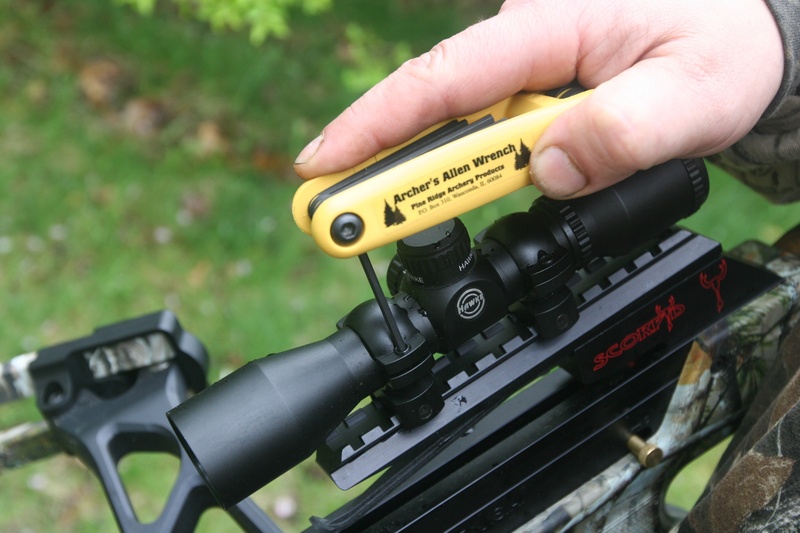 By routinely making sure everything is tight, you won’t have to worry about something falling off the crossbow in the field.” Loose nuts and bolts create more noise, which can increase the chance of a deer jumping the string. As the popularity of crossbows increases, the number of accessories also increases. Many companies, including Bowjax Inc., make noise- and vibration-reduction devices for crossbows. Adding a few Bowjax can greatly reduce the noise and vibration made by the crossbow. 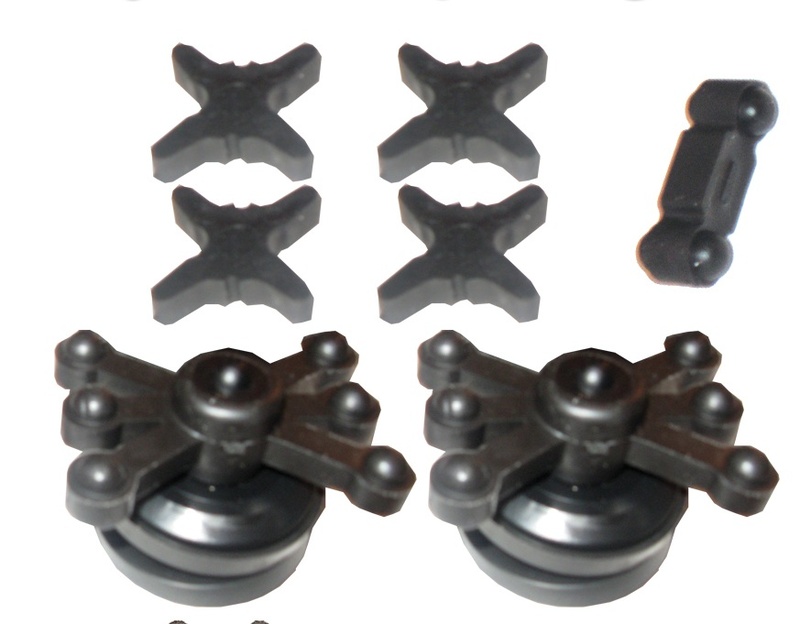 TenPoint Crossbows even offers a Bowjax accessory kit. Adding accessories, like Bowjax, will help eliminate noise and vibration. If you want to work on your crossbow or if you bring it to a pro shop, make sure the press being used on the crossbow squeezes the limbs from the tips, Kempf said. “It is important to note that bow presses that squeeze the limbs in the middle or near the bottom can easily crack crossbow limbs,” he said. “Crossbow limbs are extremely stiff, and pressing them from the middle puts more stress on them than they were designed to take. It is best if the limbs are squeezed at the tips. Squeezing them at the tips removes the pressure from the strings and cables without putting too much pressure on the limbs.” Make sure your pro shop know how to care for crossbows before they begin working on yours. Last but not least, purchase a good crossbow case, preferably one with a hard shell. Even if your crossbow gets bumped around in the back of your trunk, your scope and accessories won’t come loose and your crossbow won’t take a beating in a hard-shell case. If you plan to fly to a hunting location, a hard case is mandatory; the airline industry doesn’t allow bows, guns or crossbows to be shipped in a soft case. Crossbows may be new to many of us, but that doesn’t mean we can’t work on them ourselves. A little tender loving care will keep a crossbow going for years. Like anything, a little bit of maintenance every once in awhile is better than having to buy a brand-new crossbow! —T.B. Many hunters have the misconception that once a crossbow is sighted in, it’s ready for the woods. They treat a crossbow like a rifle: Once they hit the center of the target, they hang it up until opening day. If you shoot your crossbow a few times a year, you probably won’t know if anything is wrong unless if goes wrong in the field. Shooting a crossbow regularly, however, will improve your shooting and ensure that your crossbow is working properly. —T.B. Some people believe that compound crossbows are better, others prefer a recurve crossbow. You must decide which one is best suited for you before purchasing a crossbow. Many hunters choose a recurve crossbow because they believe they require less maintenance. Dan Wallace from Backwoods TV, for instance, uses an Excalibur crossbow with recurve limbs. He said the strings on a recurve can easily be changed, which gives him peace of mind in the field. Chances of a string breaking in the field are slim, but if you worry about it, a recurve may be a good choice. Recurves have less timing issues but, in many cases, aren’t as fast as a compound recurve. If you want lots of speed, you may want a compound. In the end, it boils down to personal preferences. —T.B. • Examine your crossbow for worn, loose, damaged or missing parts. • Replace frayed or worn strings, cables, and draw cords prior to shooting. • Lubricate the rail, or barrel, with light-grade oil. • Lubricate the trigger box, inside the trigger slot, and on both sides of the safety slide. • Wax the length of the crossbow string (except the serving) and cables, burnishing it in with your fingers. • Tighten screws and bolts. • Change your scope battery if you have an illuminated scope. • Check all your accessories for missing or damaged parts and replace or repair as necessary. This entry was posted in Uncategorized and tagged Bow wax, Crossbows, Scorpyd Crossbows. Bookmark the permalink.